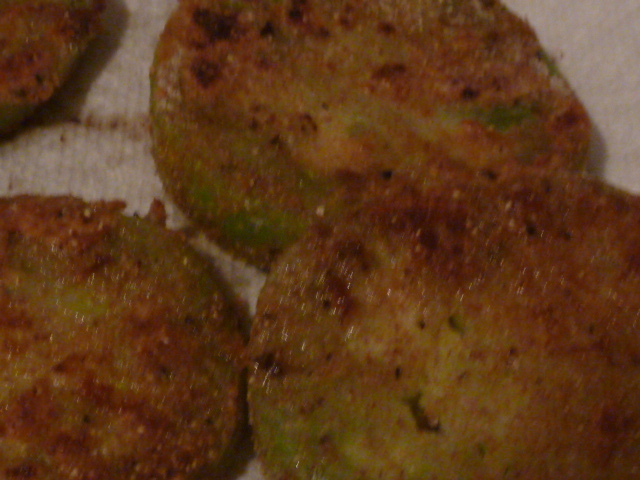 I love, love, love, love, looooove fried green tomatoes. They are one of my very favorite things about summer and one of my very favorite things about my parents garden. 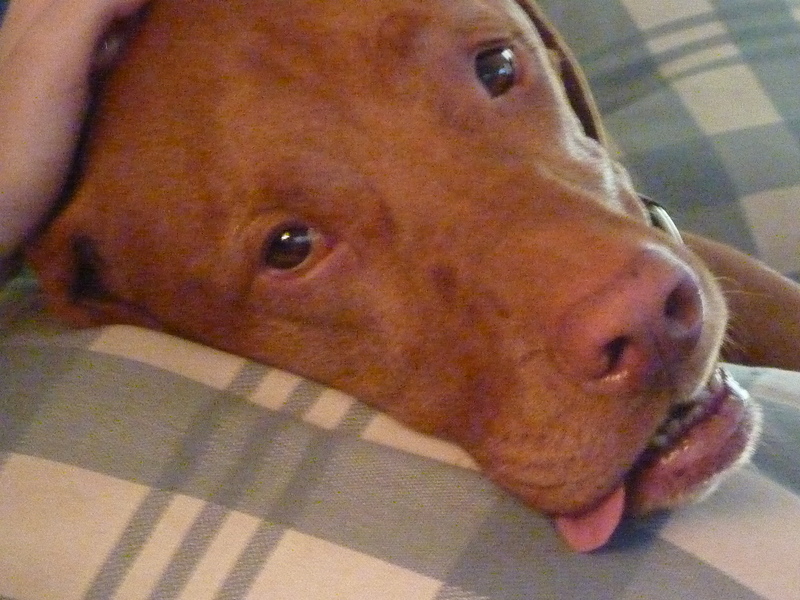 The other day, I stopped by to take care of some stuff for our (rapidly approaching) wedding and pick up Roo Bear¹, who had been having a few night sleepover at his “grandparent’s” house. My dad provided me with two ripe heirloom tomatoes and two green tomatoes – jackpot! Though I’ve posted a fried green tomatoes recipe on here before, I think this version is a little better (though, of course, it’s all a matter of taste). 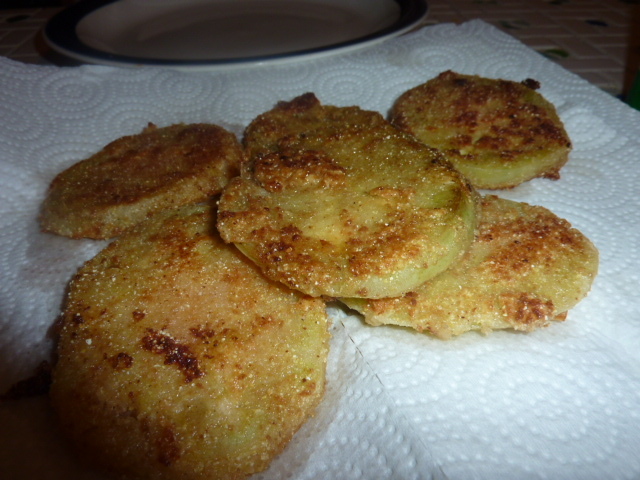 So I thought I would post it again, both because I want to spread the word on how awesome fried green tomatoes are and because it’s a slightly improved recipe. These fried green tomatoes, while intensely flavorful as is from the tart tomato and salty, crunchy, slightly-spicy coating, are also excellent served with a variety of condiments – for instance, hot sauce, Dijon mustard, or, perhaps my favorite, remoulade. Slice tomatoes about 1/2″ thick, discarding the ends. Heavily salt the tomatoes on both sides and let sit for about five minutes. Whisk together eggs and milk in a small bowl. In a separate bowl, whisk together flour, cornmeal, bread crumbs, and salt and pepper on another plate. Dip tomatoes in egg/milk mixture. Let excess drip off. Coat with flour/cornmeal/breadcrumb mixture. In a large skillet, pour canola oil. Heat over medium heat until shimmering. Fry tomatoes, working in batches if necessary. Fry about 4-6 minutes per side until golden brown. Drain on paper towels.